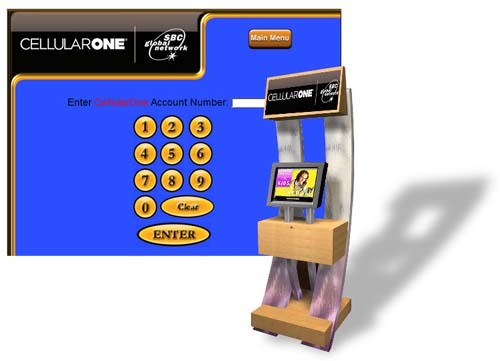 FutureTouch Technology - Portfolio Details For Cellular One, Inc.
CellularOne plans to deploy bill payment kiosks placed in convenient locations so customers can pay their bills during their normal daily activities. This project will produce a fully functional prototype system consisting of the kiosk and web server application. Customers can use either a credit card or an electronic check to pay their service bills. The kiosks serve as a user interface and functions as a "smart client" to conduct the transaction, which is handled by the existing CellularOne back-end processing system. All functions are driven from the web server, including instructions for the peripheral device controls attraction loop screens and monitoring, recording, security, and other local functions. This architecture provides CellularOne with great flexibility to target market various promotions and services by location or by customer profile.